It’s flu season time and everyone is turning to “over the counter” medications. When measuring out cough and cold medicine from the bottle, please DON’T use a regular kitchen spoon for measurement. When a bottle of cough syrup says one teaspoon they don’t mean a teaspoon from the cutlery drawer. The differences between flatware spoons volume capacities varies widely. According to this report from the Pediatrics Journal not picking the right spoon led to around 40% chance of error in dosage. It is recommended using spoons that are marked with millimeters (ml) just like used for baking and cooking. 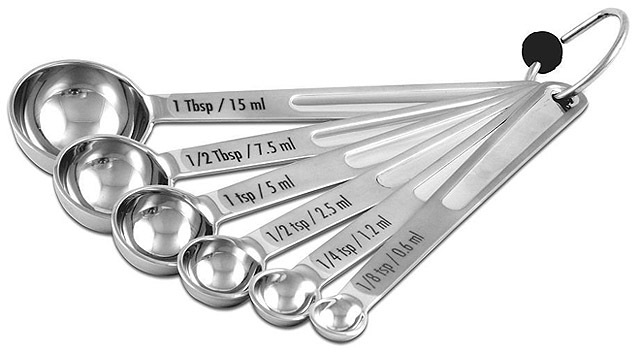 The proper measurement for a teaspoons is 5ml and tablespoon is 15ml. Wrong spoon mean 3 times the dosage which could mean bad news. You can see how half tablespoon measurements are even more difficult to eyeball without the right tool. Trying using something like the set in the picture above and link below. Just make sure the edges are safe for little mouths.